The 2016 Mummers Parade progresses down South Broad Street before spectators lining the sidewalks. 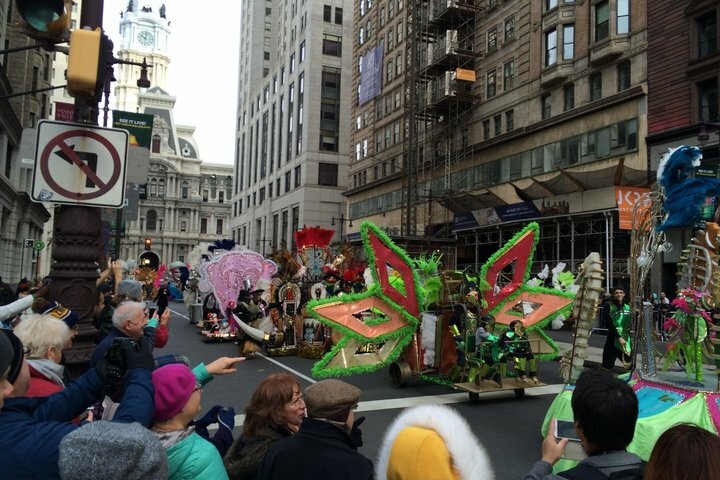 A gay man who was walking his dog with friends in Center City on Friday said he was attacked by a group of drunk Mummers. John Holtz, 28, said he and two of his friends were on Rodman Street near Broad about 2 p.m. taking a dog for a walk. The group noticed several men in Mummers gear, wearing patriotic colors and face paint. Holtz told the Daily News said some of the Mummers were urinating in the alley and all were drunk. Holtz, of Philadelphia, said the Mummers were friendly at first, but soon turned tense. One man taunted him, according to Holtz. Holtz told the Daily News he calmly asked the man to “cool it” and another guy in the group “clocked” him. A short fight began. Afterwards, the Mummers ran into the crowd, according to Holtz. A group of nearby cops asked if he’d like to file a report, but Holtz declined because it is impossible to make an identification. Meanwhile, a New York Daily News editor videotaped a member of the Finnegan NYB shouting "F--- the gays!" as he marched along Broad Street. "Finnegan loves all members of the LGBT community!! #LBGT"
Mayor-elect Jim Kenney has criticized a Caitlyn Jenner satire in the parade, performed by Finnegan. The parade has a history of being racially insensitive, misogynistic and homophobic. For the full story in the Daily News, click here.